GeoGuessr Asks, "Where Are You Now?" GeoGuessr offers the convenience of a PC game alongside the horror of being hopelessly stranded in a corn field in rural Iowa. As oversaturated as the gaming industry currently is, it takes a lot for a new game to stand out. The simplest and most common method of achieving this involves tens of millions of development dollars and a team of dozens working for years to churn out a glossy, triple-A product. The more impressive method however, merely requires a brilliant premise. 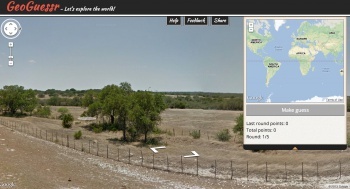 GeoGuessr, a gramatically appalling title created by Anton WallÃ©n, falls into the latter camp. The game (which is free to play - another point in its favor) sources maps from Google Earth, then drops players into a random location somewhere in the known world via Google's street view. From there you're given the freedom to explore a small area around you before being asked to guess at your current whereabouts. Once you've either sussed out your location or failed horribly in your attempts to figure out where the 'eff you are, GeoGuessr awards you a score based on how well you performed. Guess right, get more points. Guess wrong, spend eternity in the hell that is South Dakota. Obviously the best bit of this game is that it's utterly gratis and you all can enjoy it right this very moment by paying a visit to the official GeoGuessr site. However, WallÃ©n is reportedly working on an update for GeoGuessr that will allow for competitive play between at least two (and possibly more) players. There's no release date for this update, nor any specific word on what it might include. That's probably for the best though. I'm apparently unable to locate anything outside of the greater Portland area, so I'd really rather not humiliate myself in the event that pigeons learn to use the 'net. Almost forgot: We've got a comments section below and hate the idea of any of you being productive, so feel free to share your high scores. Mine's currently at 10,531.